The heart of Philly's food scene has been around for over 125 years. Here are some of our favorite places to shop, sip and dine in the historic food hall. Philadelphia was built around its markets. The city has flourished and failed on the backs of its street grocers, the region’s farmers, and the 800 six-foot stalls that made up the original Reading Terminal Market. Reading Terminal is a direct descendant of the original public markets that William Penn envisioned when he sketched Philadelphia into life — the open-air produce stands and grocers’ stalls that gave Market Street its name as they stretched six blocks from the Delaware River waterfront and into the core of America’s first city. It was the throbbing, beautiful, edible heart of the city for decades. But the bad years came: the Depression, the obsolescence of the railroads. Bankruptcy and inattention nearly killed the place. But now, at 125 years old, Reading Terminal Market is more vital than it has been in half a century, sitting at the center of the Philadelphia region’s food system and our city’s conversations about what we eat. Local farmers still bring their goods to the market, although more stands offer sandwiches to hungry conventioneers and tourists than dry goods and produce to city residents. But with a recent influx of new vendors, the market has more to offer locals than ever. Let’s go to market. There are no slow days at Reading Terminal. There are slow times, though — like before and after the lunch rush on weekdays, which makes the market the perfect place to stop on your way in to work to grab a locally-roasted morning cup. 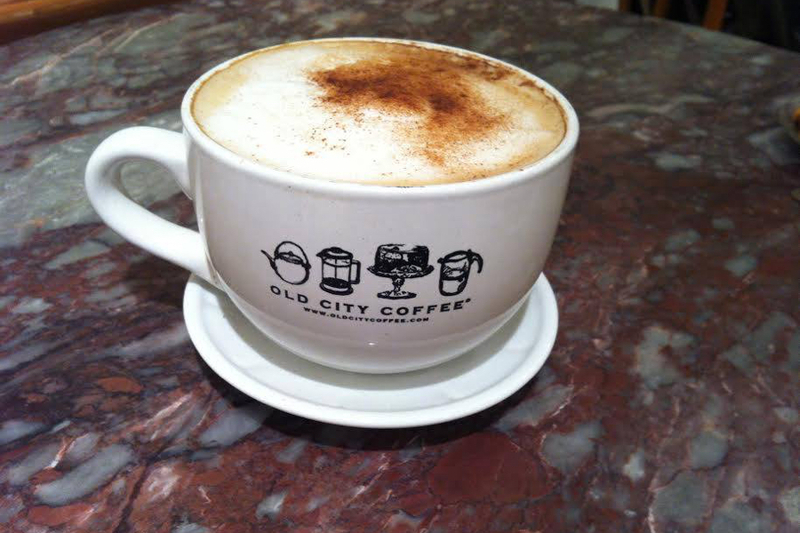 Get yours from Old City Coffee at one of their two stalls, one at the 12th and Filbert entrance and the other across the market midway down the 1100 block of Arch Street. Flying Monkey Bakery in the market’s Center Court and Termini Bros. Bakery on the Filbert side both offer alternatives — One Village and La Colombe coffees, respectively. If you’re grabbing a bite on the way in to work, there’s no quicker or more delicious option than Miller’s Twist. The soft pretzel and ice cream spot starts its day with their big, tender soft pretzels as well as one of our favorite market delicacies: that same pretzel dough wrapped around fluffy egg and melted cheese (with sausage, bacon, and turkey sausage options available). If you’ve got time to grab a counter seat, belly up to Smucker’s Quality Meats & Grill for a breakfast sandwich with your choice of pork roll, scrapple, or turkey scrapple — and stock up on a huge selection of jerky while you’re at it. Looking for something sit-down rather than grab and go? 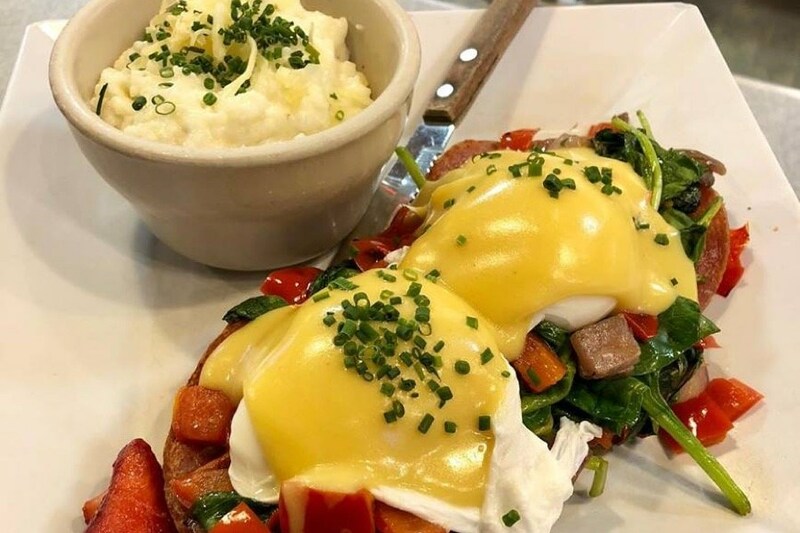 In addition to seafood favorites, Pearl’s Oyster Bar has a shockingly great morning menu with dishes like chicken and waffles Benedict, omelets, and bacon-banana French toast. DiNic’s has been slinging iconic roast pork sandwiches since 1918, but the stand really blew up when it was named Best Sandwich in America by the Travel Channel in 2013 — so it’s a magnet for tourists and conventioneers hitting the market. 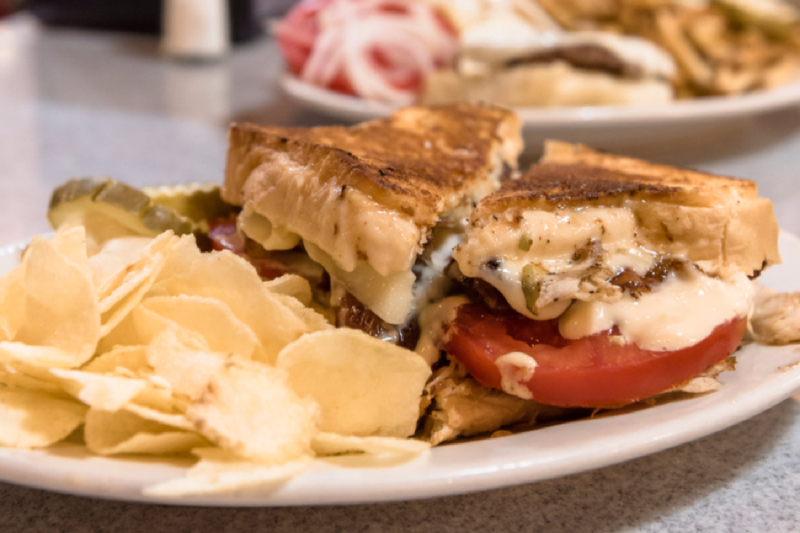 Your best bet for a short line is any time before or after the lunch rush (between 11 a.m. and 2 p.m.), but it’s best to plan on a DiNic’s sandwich when you’ve got some give in your schedule. No matter how long the wait, it’ll be worth it. Or for a Dagwood-style, super-stacked sandwich that rivals the best delis in New York, Hershel’s East Side Deli is the place to go. 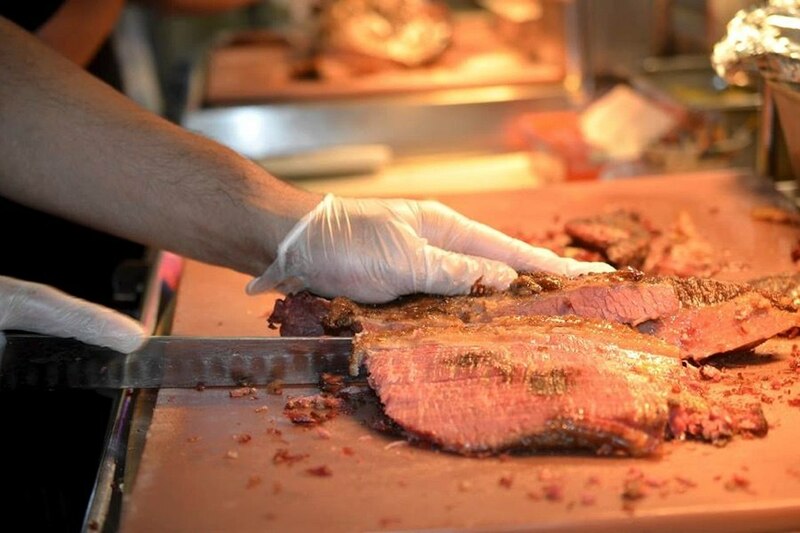 In addition to juicy, house-made pastrami, corned beef, and brisket, you can order up classics like matzo ball soup, knishes, lox, and New York-style cheesecake. At the back of the market, Valley Shepherd Creamery and Meltkraft do double duty as a gourmet grilled cheese stand and a destination for artisan wedges, offering cheeses from the New Jersey creamery as well as Northeast heavyweights like the Cellars at Jasper Hill at the case and gooey, melty pressed sandwiches at the counter. 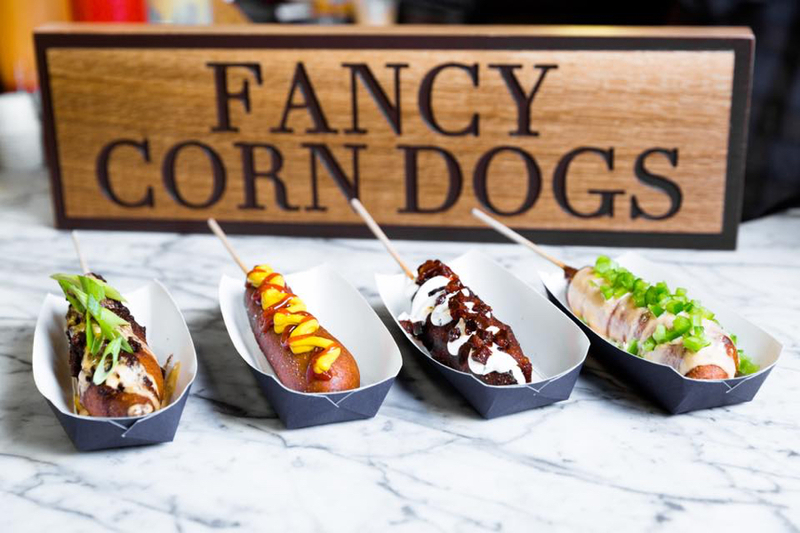 One of our favorite spots in the market for crispy comfort food is Fox & Son Fancy Corndogs, which puts all your favorite deep-fried treats on one menu. Former Valley Shepherd/Meltkraft managers Rebecca Foxman and Zeke Ferguson spun off with this stand a few years ago, sourcing fresh cheddar curds from Birchrun Hills Farm in Chester County. Near the 12th and Arch entrance, Beiler’s Donuts & Salads offers dozens of fried dough flavors, plus tubs of briny pickles and your favorite mayo-based salads, too. Looking for some vegan comfort food? 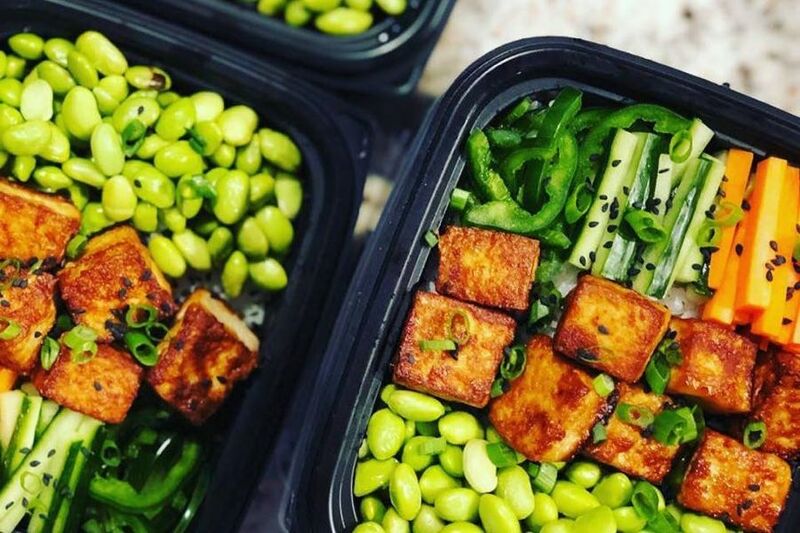 Luhv Vegan Deli recently opened, offering pretty much anything you can get at a normal deli — only made from plant proteins, black beans, garbanzo, flaxseed, tofu, and seitan. Seriously, they do wrap sandwiches and a reuben, chili, gluten-free soups, breakfast sandwiches, veggie burgers, baked goods and, on the side, vegan cold cuts and cheese by the pound (plus gluten-free bread to go with them). And for sit-down soul, you can’t beat Keven Parker’s Soul Food Cafe, where you can watch Whitney Houston and Beyoncé performances on a TV screen while you order. Our go-to plate? The fried chicken with two sides (we go with baked mac ‘n’ cheese and green beans or collards stewed with smoked turkey until tender). Head to Beck’s Cajun Cafe for muffaletta sandwiches, more mac ‘n’ cheese, deep-fried beignets, and the Trainwreck, one of the very few variant cheesesteaks in this city that’s worth a damn. Amid the cheesesteaks and hoagies, Reading Terminal boasts a variety of vendors serving cuisine from around the globe. Little Thai Market’s salmon curry draws crowds, so line up early. Grab a counter seat at Sang Kee Peking Duck and order anything with noodles, preferably with duck in it. Or head to Nanee’s Kitchen for Indian and Pakistani treats like lassi, halal meat dishes, and an array of vegan and gluten-free curries, Kamal’s Middle Eastern Specialties for falafel, and Olympia Gyro for, well, you know. 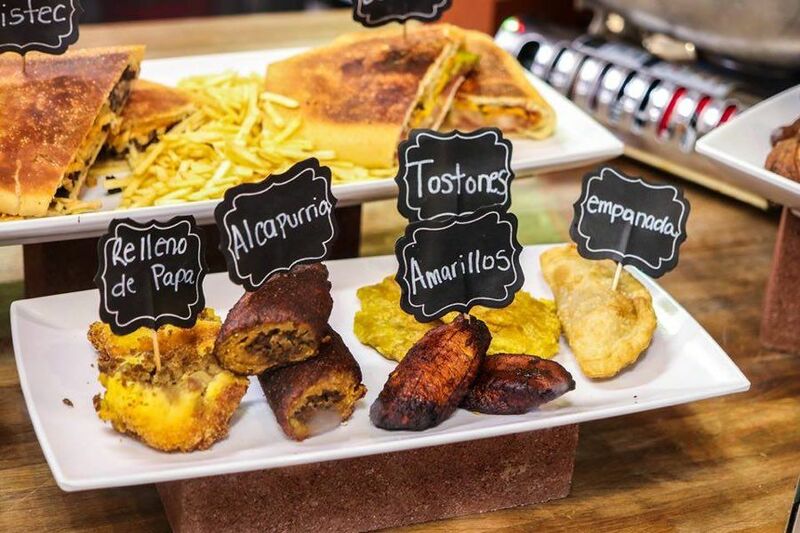 And Loco Lucho brought Puerto Rican and Latino flavors into the mix last year with Cuban sandwiches, tostones and empanadas, rellenos de papa (a perfect lunch, when paired with the picadillo-stuffed alcapurria or some pinchos) and paella. If you show up early, they also do Cuban-style breakfast sandwiches, too. In addition to the Beiler family’s growing donut empire, there’s a whole section of the market — the “Dutch Corner” at 12th and Arch — where tourists can take a bite of Pennsylvania heritage and area natives can get a taste of home. For something smoky and meaty, order up a rack from the Rib Stand or a half-bird from Dienner’s Bar-B-Q Chicken. And don’t miss the Dutch Eating Place, which has all the classics — pork and sauerkraut, chicken and dumplings — plus desserts like shoo-fly pie and apple dumplings, wrapped in golden-brown pastry. Also, if you can manage to snag a seat during breakfast, they do some of the best blueberry pancakes and apple-cinnamon french toast you’ll find. The market has upped its game considerably in terms of convenience in recent years: Condiment, a second stall from Flying Monkey’s Elizabeth Halen, makes Reading Terminal a one-stop grocery shop, with dips, sauces, compound butters, sides, and side dishes to complement the fresh produce, meats, and fish you just bought — or take home one of their prepared meals if there’s no time to cook. Birdie’s Biscuits, one of the market’s day stall vendors, posts up with boxes of ultra-flaky, cat-head biscuits, made from scratch and ready to mop up a delicious sauce or gravy on your dinner plate. La Divisa Meats is the market’s whole-animal butcher shop, bringing fresh-cut, pasture-raised meats to the city. Get custom cuts to cook up in your own kitchen, or stock up on butcher-owner Nick Macri’s charcuterie to supplement your next cheese board. And for dry goods, the Head Nut has you covered, their bulk bins brimming with everything from candy and nuts to baking powder and Spanish saffron — or hit up Jonathan Best Gourmet Grocer, which stocks pantry ingredients galore as well as hard-to-find international goods. Looking for something sweet in Reading Terminal Market is like being, well, a grown-up in a candy store. In addition to funnel cake and donuts, there are several stands devoted to dessert: Flying Monkey sells signature baked goods like its Pumpple Cake (that’s a double-layer cake with an apple pie baked inside one layer and a pumpkin pie in the other) and — our favorite — golden slabs of butter cake, the densest, richest shortbread you’ve ever tasted. 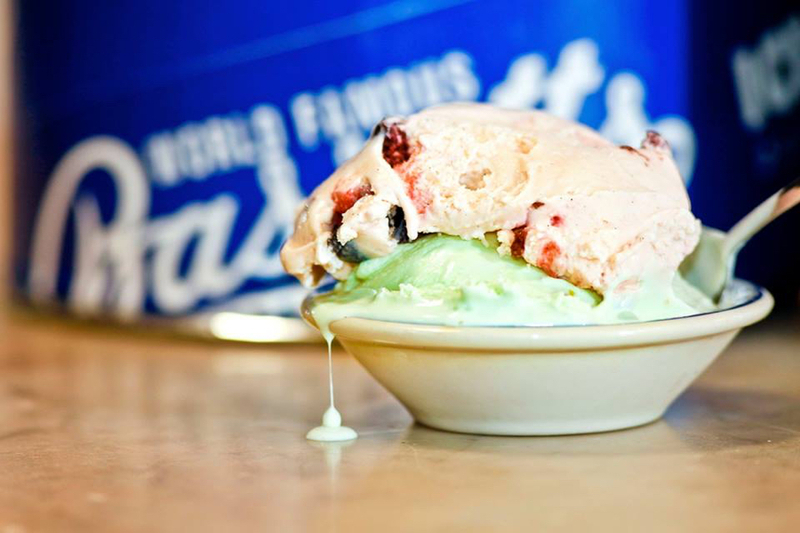 For Italian classics like cannoli, head to Termini Bros. on the Filbert Street side, and for something cold, there’s Bassett’s Ice Cream with scoops and shakes. For straight-up candy, though, you’ll want to hit up two stalls: one is Chocolate by Mueller, which has just about anything you could ever want, candy-wise, and several things (like the chocolate-covered onion) that you don’t. The other is the Sweet as Fudge Candy Shoppe, near where the Dutch Corner meets the middle of the market, for slabs of handmade fudge and bins of colorful penny candy. In addition to an eclectic menu for every time of day, Molly Malloy’s sells beer, wine, and cocktails. 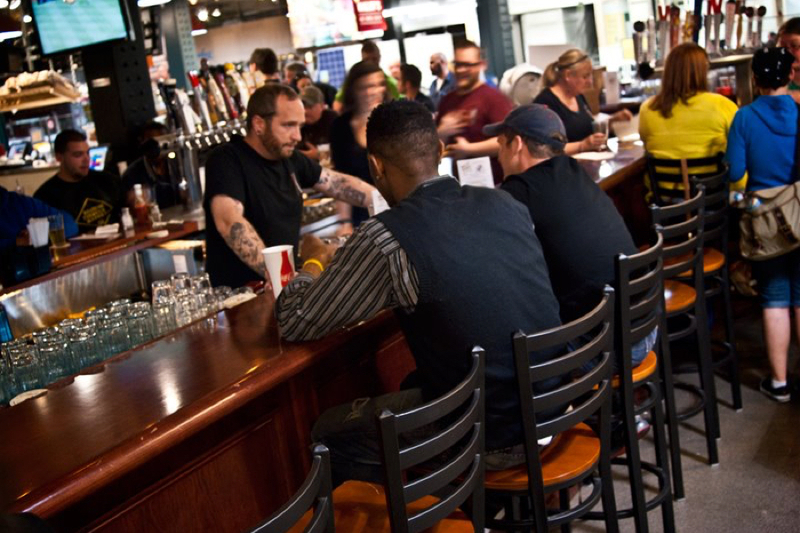 If the bar is bumpin’ and you can’t grab a seat, no worries: you can take your adult beverage to go and sip while you shop (just stay inside the market till you’ve drained your cup). If you’re looking for something to go with dinner tonight, check out the Pennsylvania Pour Collective, a group of local distillers who’ve all banded together, taken the spot across from Old City Coffee (on the Arch Street side of the market), and put together a collaborative tasting room where you can meet producers, sample products and buy bottles to take with you. Right now, they’ve got Boardroom Spirits (vodka, gin and rum), Eight Oaks Craft Distillers (bourbon, applejack, rum, gin and vodka), New Liberty (blended whiskeys, rye, rum and bourbon, plus a new Dutch malted whiskey), Original 13 Ciderworks (hard cider) and Pezone Row Home Grown Cello (a variety of cellos, from limoncello to weirder ones, like chocolate-strawberry). Recently, Reading Terminal started using various smaller, less permanent locations inside the market to rotate some new sellers through. It started with one-offs and local distillers selling out of carts set up near Center Court. Now it’s a full-blown program with several operators sharing space and locations on a rotating basis. Amina Aliyako brings Amina’s to the market on weekdays, and she comes with a great story: a Syrian refugee who fled Aleppo during the civil war, Aliyako started out with a part-time cleaning job at Reading Terminal and, in a year, became a vendor. Now, she sells pastries, hummus, rice pudding topped with cinnamon and pistachio, pickled vegetables, mutabal, and other traditional Syrian street foods. Really Reel Ginger sells ginger candies and drinks. People are obsessed with the banana pudding at Sweet Nina’s (operating Wednesday through Saturday across from the Little Thai Market). TortiYeah does modern Spanish tapas on Thursday through Sunday, focusing on tortilla Espanola, the “mother of all tapas.” And every day, What A Crock does pre-assembled meals for you to prepare in your slow cooker. 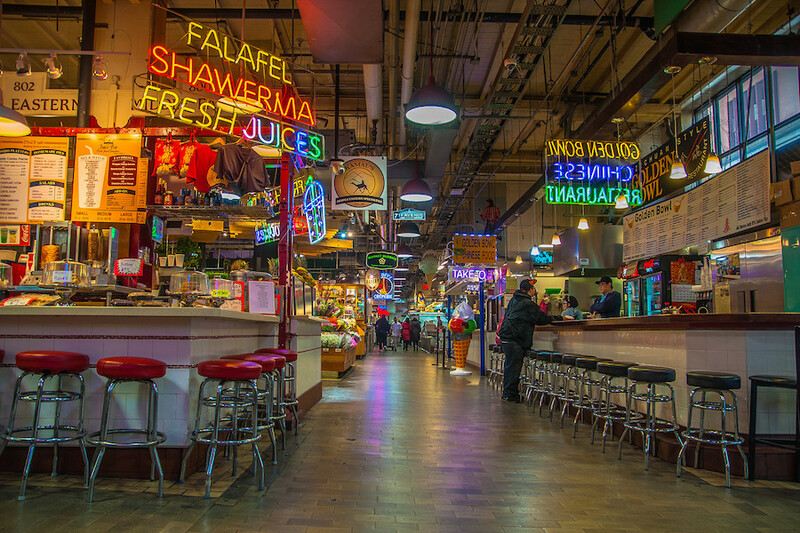 Reading Terminal Market has some new vendors in the works for 2019, too. 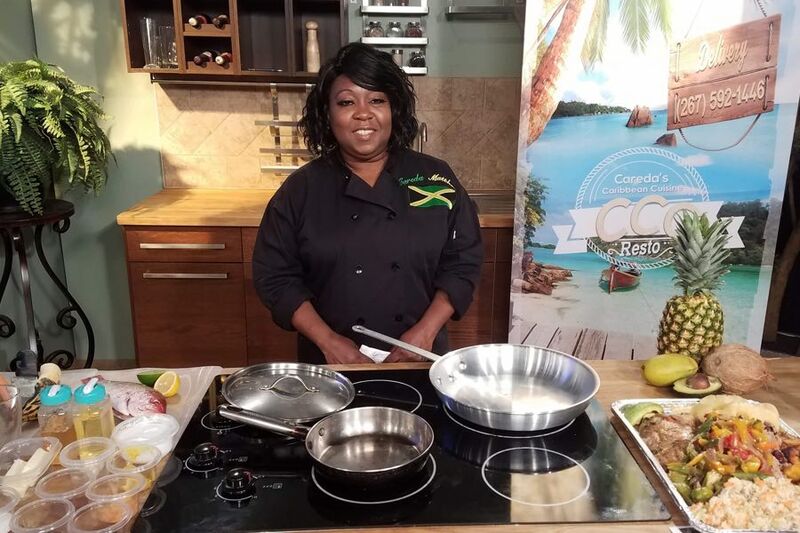 Careda’s Caribbean Cuisine, from Jamaican-born chef Careda Matthews, is set to open this spring in the spot along 12th Street formerly occupied by Carmen’s Famous Italian Hoagies & Cheesesteaks (don’t worry, they just moved across the aisle). Matthews is another market employee who’s moved into the role of proprietor; she worked at the erstwhile stand Delilah’s, ran her own catering company, and then lent her talents to KeVen Parker’s Soul Food before taking this step. She’ll serve dishes like oxtail stew and jerk chicken. The market is getting in on the city’s sushi boom, too. Umi Seafood and Sushi Bar, a collaboration between vendor Suzi Kim of John Yi Fish Market and Bluefin proprietor Yong Kim, will open in early summer in the space formerly occupied by 12th Street Cantina.